I’ve been curious about solo (or solitaire) board gaming for a while now, and while I recognize that it likely sounds weird to folks who aren’t into board games — and, honestly, it still seemed a bit odd even to me until I tried it — it really isn’t much different than sitting down to play a video game. 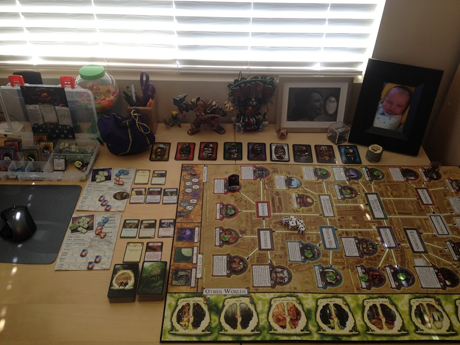 Having debated different options and discarded them all for one reason or another, I hit on Arkham Horror. I’m a huge fan of H.P. Lovecraft, and of Call of Cthuhlu, so from that standpoint it seemed like a great fit. But I’d also heard that it takes forever — 4-6 hours depending on the number of players and other factors — and has a high luck factor, something I don’t usually enjoy in games. 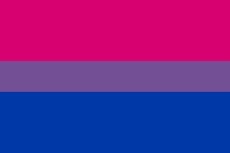 Still, I like trying new things, especially games, and it seemed like a chance worth taking. When it arrived, I read the rules and set it up on my desk — which it fills almost completely, leaving just enough space to work. I started the game over the weekend, taking a few turns while everyone else was asleep, and finished it up on Wednesday night. It took about three hours altogether; I played with two investigators (Darrell and Drake, chosen randomly) and probably screwed up a rule or two here and there. It’s a fantastically evocative game. One of the coolest things I’d heard about it was that it tells a story, and that was absolutely true. The mood and feel are Lovecraftian — shading into Pulp, and perhaps closer in tone to the RPG than the stories — and the flow of the game is unique. I would have been happy to lose, and expected to several times; the story would have been just as interesting. As it was, Darrell and Drake stumbled around at first, literally clueless, as Azathoth stirred and gates opened all across Arkham. They both went insane and had to recover at Arkham Sanitarium, and that combined with Nodens’ Favor turned the tide. As townsfolk (and Allies, and shopkeepers) fled the city, Darrell became a police deputy and started driving his police car through gates to other worlds and back again. (It eventually broke down.) Drake joined the Silver Twilight Lodge and gathered clues to pass along, and Darrell closed and sealed the remaining gates — sealing the sixth with the terror level at 9, Arkham nearly overrun with monsters. The last defenders of Arkham, armed with forbidden lore, managed to save the city. And it didn’t feel weird. Really no different than jumping into a video game, prepping an adventure for next week’s gaming session, or any other similar solo creative play-type activity. I’ve always looked at board games as a fundamentally social activity, but I’m glad I expanded that view. Playing solo, particularly in short bursts over several days, was fun in its own way. I’d love to try it again with a group of like-minded folks, expecting a longer game, but I’m also looking forward to playing it again solo. 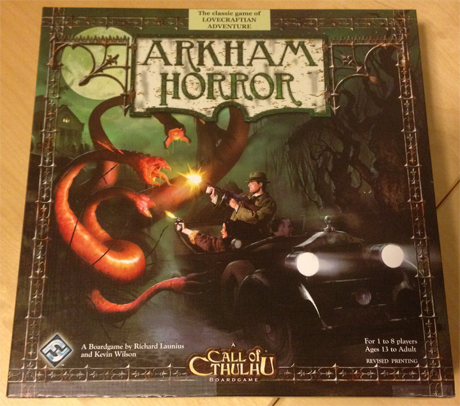 If you’re in the market for a solitaire-friendly game and like HPL, Call of Cthulhu, or adventure-style games in general, Arkham Horror is worth checking out.